The Israeli occupation police are to detain Sheikh Raed Salah on the eighth of May and will allow all media outlets to broadcast the news along with photos of Salah handcuffed and clothed in the blue uniform of prison to terrorize all those who defend al-Aqsa Mosque. 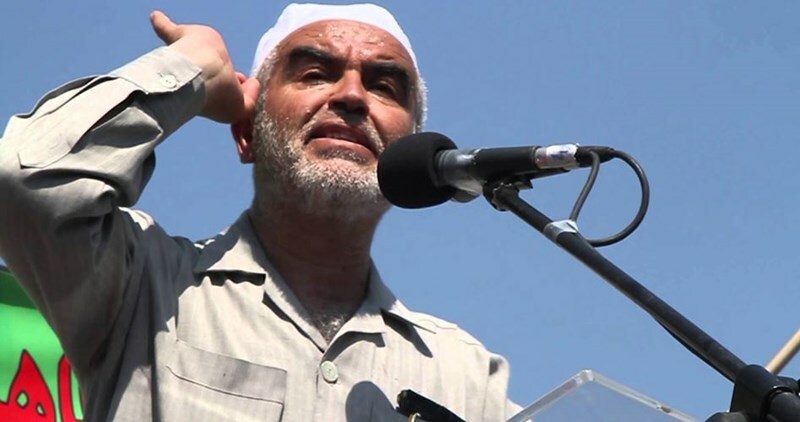 The Israeli occupation authorities (IOA) has recently sentenced Sheikh Raed Salah, head of the Islamic movement in the occupied Palestinian territories, to nine months, starting on the date mentioned, under the pretext of incitement to violence and racism in Wadi Joz speech in 2007. All Jewish extremist parties in recent months took turn in the incitement against Sheikh Salah, even the top of the pyramid of the Zionist regime, Benjamin Netanyahu, who accused him two weeks ago of trying to blow up the situation in al-Aqsa Mosque with the advent of the Easter holiday. The Israeli authorities tried since February 2007 to find out from between the lines of Sheikh Raed Salah's Wadi Joz speech anything to charge him with, so as to take him away from the scene in Jerusalem and Al-Aqsa by detention. Zabarqah indicated that Salah's speech addressed the crimes of the occupation, speaking about the required support for Jerusalem and al-Aqsa Mosque from the Arab and Islamic nation. The Israeli occupation responded by an indictment and a case against him that dates back to 2007, but it only recently passed a prison sentence of nine months against him. Dr. Jamal Amr, an expert in the affairs of Jerusalem and the settlements, told the PIC reporter that he had attended the speech personally and that it did not violate the law, stressing that "the occupation's goal is just to find a pretext to silence and kill the sound of resistance, and outlaw all of the Sheikh's activities and to make him an exemplary to anyone who follows his path". Amr expects that the occupation will open other files against Sheikh Salah after dealing with the file of Wadi Joz speech; including the file of financing sources and his association with outlawed movements, and the file of obstructing the police's work; these files will be as pretexts to constantly keep him under the threat of detention. Al- Aqsa Mosque is currently living "in the eye of the storm", as described by Fakhri Abu Diab, academic activist in institutions founded for the defense of the territory of Jerusalem, "Because the occupation targets anti-occupation activists, especially in Jerusalem." The Israeli premier's accusation against Sheikh Salah of inciting violence with the advent of the Easter holiday constituted an attempt to ride the wave and win the support of the extreme right. Lawyer Zabarqah believes that the incitement by Netanyahu as the head of Israeli government creates the conditions for targeting Sheikh Salah physically by Jewish extremists. He continues: "The second explanation is that Netanyahu's statement carries an interference of the government in the work of the judiciary, which is incompatible with the democratic system, but Netanyahu bypasses it to silence Sheikh Salah." Removing Sheikh Raed Salah off the scene, especially after the understandings of the United States Secretary, John Kerry, in 2015, creates conditions –according to lawyer Zabarqah's analysis- to target al-Aqsa Mosque, taking advantage of the decline of Arab and regional positions. The conditions that al-Aqsa is passing through are not only bad political and field conditions but the problem here is that they coincide with the official Arab regimes collusion with the Israeli occupation, according to Zabarqah's viewpoint. “This creates a historic opportunity for the occupation to Judaize al-Aqsa”. Dr. Jamal Amr said that "the leaning of the Israeli society to the extreme right encourages Netanyahu to incite against Sheikh Salah to win their electoral votes”. He added: "Netanyahu fights any Islamic trend in the region to weaken it, especially in Jerusalem, as the region respects the strong. He also tries to create confusion and to frustrate the Arab ordinary citizen by saying that he had contacts with Sunni Arab states". Among the most serious attempts to Judaize al-Aqsa Mosque monitored by expert Amr is a recently issued map for tourists where al-Aqsa Mosque is not mentioned at all, but rather signs with "Temple Mount" are written on it in place of the Aqsa. The absence of Sheikh Raed Salah from the streets of Jerusalem and Al-Aqsa would facilitate the Judaization and violations in Jerusalem by the Israeli occupation and the extreme right, as Salah represented personally, and with his movement and followers, a bulwark in face of the Judaization practices. Fakhri Abu Diab confirms that Salah is a link between Palestine and the outside world. He, furthermore, gives moral, psychological and material support for the sit-inners, because of which his movement was banned last year and now he is to be jailed. The number of these worshipers, however, had decreased due to the decision of banning the Islamic movement, and now will decrease more due to the detention of the Sheikh, he added. Abu Diab pointed out that the absence of Salah from the scene will affect the restoration projects of homes in the Bustan neighborhood of Silwan and the aid provided for the poor families living in the vicinity of al-Aqsa and Jerusalem; it will affect as well the support of Muslim and Arab institutions which prefer to contact with him personally. 25 right-wing Jewish organizations are in agreement on targeting Sheikh Salah under Israeli political and security cover and protection in an unprecedented harmony. Preparations are still under way in 1948 occupied Palestine by all parties and activists to accompany Sheikh Raed Salah, on the eighth of May, in a march that starts from the town of Umm al-Fahm, at eight o'clock in the morning reaching the Ramle prison gate, to which Sheikh Raed will be transferred to serve his prison term. The Israeli Prison Service (IPS) moved two Palestinian hunger strikers from Ayla solitary confinement to Megiddo and Jalbo prisons, the Palestinian Prisoners Society (PPS) revealed Tuesday. 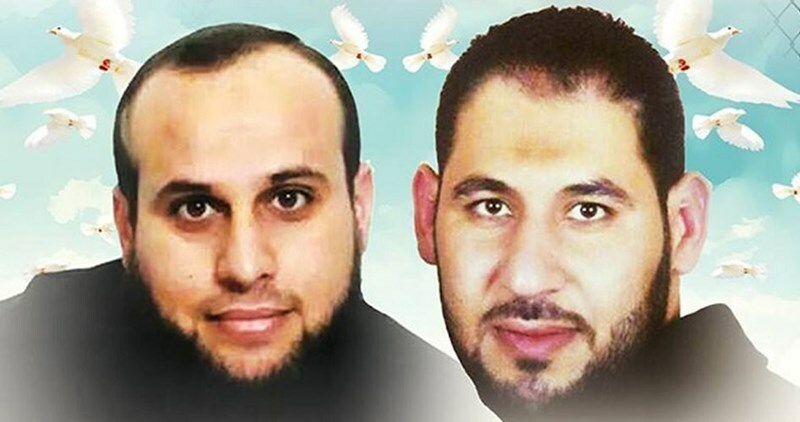 The two prisoners Fuad Assi, 30و and Adim Maferjeh, 29, have earlier declared hunger strike in protest against their illegal administrative detention. IPS has imposed a number of punitive measures against the two hunger strikers in an attempt to break their protest strike, the PPS added. Meanwhile, the Palestinian prisoner Sami Janazra, who is currently held in Soroka Hospital, is still on hunger strike for nearly two months. On the other hand, a state of tension has prevailed among Palestinian prisoners in Nafha prison on Tuesday morning after IPS stepped up its punitive measures. The prisoners closed all the prison’s sections in protest against the prison administration’s provocative policy against them. Prisoners Media Center said that the prisoners’ protests have escalated after the prisoner Jamal al-Hur was moved to Eshel prison without prior notice. There are currently more than 7,000 Palestinian prisoners held in 22 Israeli jails and detention centers including women, children, and journalists amid very difficult detention conditions. 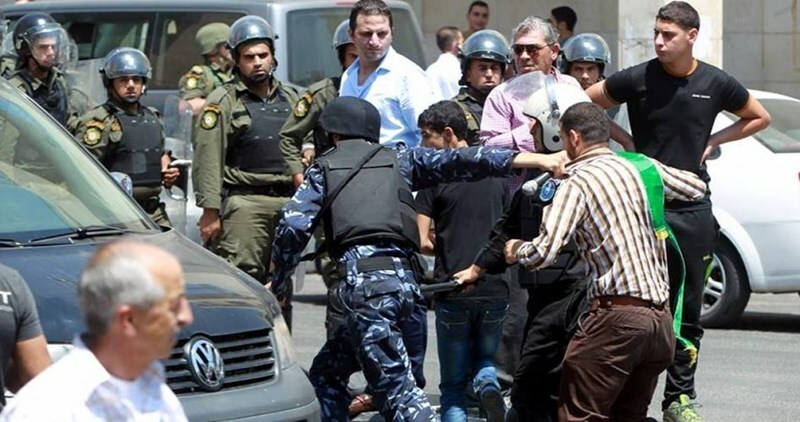 The Palestinian Authority (PA) security apparatuses arrested 10 Palestinians from the occupied West Bank and injured others on account of their involvement in anti-occupation activism. Reporting from Nablus, a PIC journalist said the PA attacked a reception held to welcome the newly-released detainee Alam Ubeid after nine years in Israeli jails. Several Palestinians were left injured as the PA forces showered the area with live bullet fire. In Tulkarem, the PA Preventive Forces kidnapped the ex-prisoner Alaa Shreitah just one month after he had been released from Israeli jails, where he had spent 14 years. The same forces kidnapped 22-year-old Ahmad Abu Zuhra from his workplace. Sources-based in Ramallah also said the PA forces kidnapped the ex-prisoner Musaab al-Barghouti, who had previously been tortured in PA lock-ups. Meanwhile, the Israeli occupation forces kidnapped three young men from Termes’aya village, a couple of days after they had been released from the PA prison, where they had served a three-month-sentence on charges of planning for anti-occupation activities. A Palestinian instructor and university student were also kidnapped by the PA General Intelligence from al-Khalil city. The PA intelligence in Bethlehem kidnapped the youngster Ahmad Radi from the Aida refugee camp at the same time as the PA Preventive Forces kidnapped the two brothers Khalil and Omar Kanaan, enrolled at the Quds University. Ibrahim Surur was also kidnapped in the process. Earlier, on Monday evening, the PA intelligence troops kidnapped the journalist Adeeb al-Atrash after they summoned him for interrogation in al-Khalil, the journalist’s family told the PIC. Journalist al-Atrash was arrested shortly after he had received his MA degree from a university abroad. The family slammed Israel’s abduction of their son, saying the move is a serious violation of Palestinians’ right to the freedom of the press. Update: The soldiers kidnapped, on Tuesday afternoon, a young Palestinian man, identified as Tareq Aziz al-Abbasi, from his work in Jerusalem. 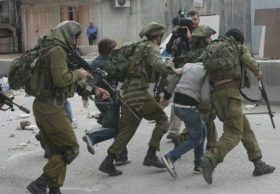 Updated From: May 3, 2016 @ 13:29 Israeli soldiers kidnapped, on Tuesday at dawn, 21 Palestinians in different parts of the occupied West Bank, mainly in occupied East Jerusalem, after the soldiers invaded and searched dozens of homes. The Palestinian Prisoners Society (PPS) said the soldiers invaded and searched many homes in Jerusalem city, and kidnapped four Palestinians identified as Khaled Shaweesh, Sami Abu Romeila, 15, Adham Abu Najma, and another young man who remained unidentified until the time of this report. It is worth mentioning that Abu Najma is a former political prisoner, who was held under house arrest, before the soldiers abducted him. The PPS added that the soldiers also invaded and searched many homes in al-Jadeera and Bir Nibala towns, in the Jerusalem district, and kidnapped six Palestinians identified as Dia Mohammad Shehada, 20, Rashad Abdul-Fattah Barjas, 19, Mohammad Saed Barjas, 19, Tareq Abdul-Karim Barjas, 17, Khaled Aziz Zeidan, 50, and Mohammad Nizar Zeidan, 24. Mohammad is the son of Nizar Zeidan, who is held by Israel, and is serving a fifty-year imprisonment term. In Nablus, in the northern part of the occupied West Bank, the soldiers invaded and searched many homes, and kidnapped Monir Sami Abbad, Saleh Farah Abbad and Waddah Saleh ‘Oleyyan. The soldiers also kidnapped two Palestinians from the northern West Bank district of Tulkarem, one of them, identified as Nidal Bassam Thareefa, 40, was kidnapped near the al-Karama border crossing with Jordan, and the other was identified as Bilal Nimir Ajaj, 25. In Bethlehem, the soldiers invaded Marah Rabah village, and kidnapped a mute and blind young man, identified as Emad Ahmad Faqeeh, 23, in addition to Odai Hani Taqatqa. In the central West Bank district of Ramallah, the soldiers invaded Turmus Ayya village, and kidnapped Jamil Mustafa Tayyim, 20, Mahmoud Methqal Saleh, 20, and Mohammad al-Amin Kanaan, 20. In the southern West Bank district of Hebron, the soldiers searched several homes and kidnapped one Palestinian, identified as Mohsen Mohammad al-Ja’ba, 22. 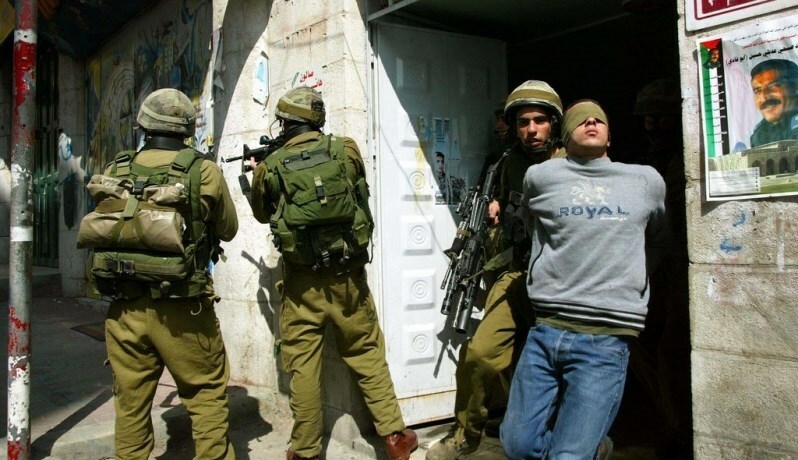 The Israeli Occupation Forces (IOF) arrested at dawn Tuesday six Palestinians after carrying out combing and raid operation across the West Bank. 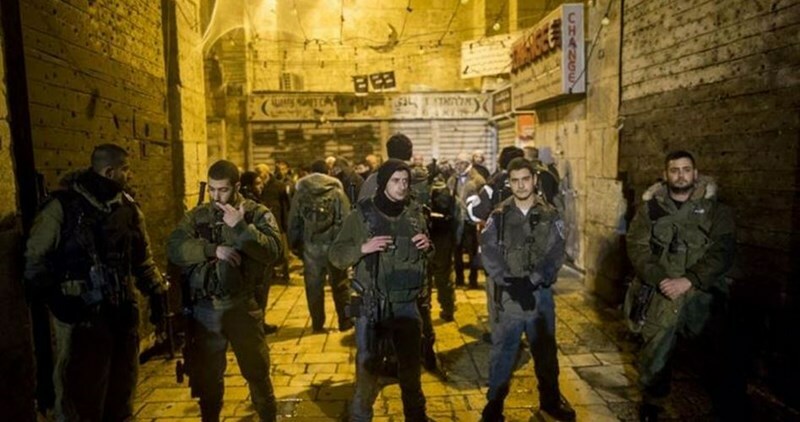 In al-Khalil, Israeli forces arrested three Palestinians from different parts of the city. Eyewitnesses told the PIC reporter that two arrests were carried out in al-Louz neighborhood while the third was arrested after being stopped while driving in the area. In Bethlehem, Israeli forces arrested two young men after violently breaking into their homes. One of the detainees is with special needs. An ex-prisoner who spent more than ten years in Israeli jails was also arrested in Nablus. Meanwhile, Israeli forces closed without prior notice all entrances leading to Barta’a town in Jenin to the north of occupied West Bank and carried out a combing operation amid overflights of Israeli helicopters. A state of high alert was declared by the IOF in the town and all the neighboring villages. Local sources told the PIC reporter that Israeli soldiers were calling out from a loudspeaker for a settler who is apparently missing. The search operations lasted from late at night till early morning, the sources added. The Israeli occupation forces (IOF) at dawn on Tuesday knocked down the family home of the Palestinian detainee Zaid Amer in Nablus province. A PIC journalist quoted Zaid’s brother, Ghassan, as saying that several Israeli army vehicles and patrols rolled into the Amman Street at 3 a.m. and broke into Zaid’s home before they reduced it to rubble. He added that the demolition procedure lasted for three hours and targeted the interior and exterior walls of the building. Zaid’s home was evacuated some few days ago after the family had received a demolition notification a couple of months earlier. The Israeli Supreme Court turned down an appeal filed by the family to cancel the demolition. 26-year-old Zaid Amer, from Nablus, got married a few months ago. He was arrested by the IOF just a couple of months after his wedding on allegations of his involvement in an anti-occupation shooting attack in early October 2015 near Beit Furik town, in eastern Nablus. 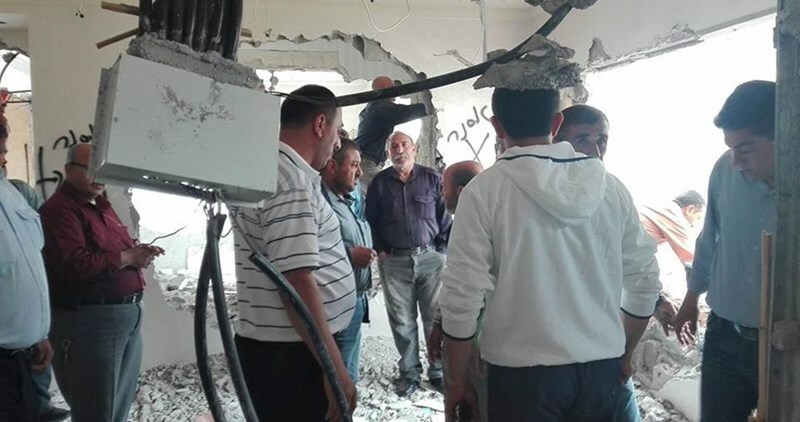 Earlier, the IOF had demolished the homes of four Palestinian detainees who allegedly planned for the anti-occupation attack. Two other demolition orders are also expected to be issued by the Israeli Supreme Court on the same account. Meanwhile, an undercover Israeli troop kidnapped the Palestinian youth Muhammad Samara from eastern Nablus. 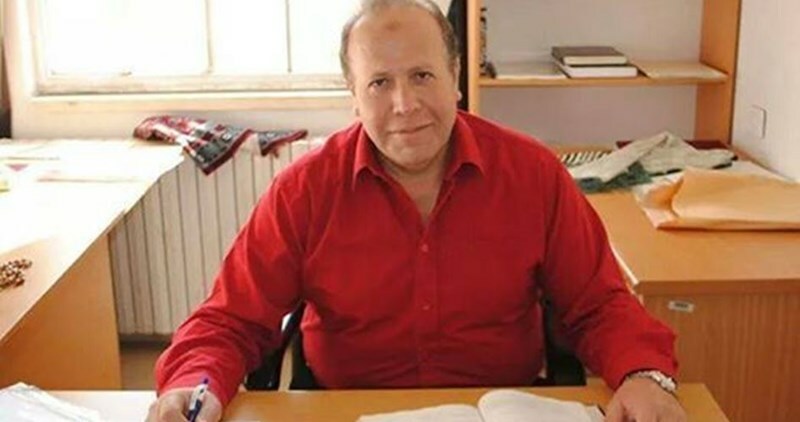 An Israeli court on Monday issued an administrative detention order against Palestinian astrophysicist Imad Barghouthi, from Ramallah. The family of Barghouthi told the Palestinian Information Center (PIC) that he would be detained administratively for three months, describing the verdict as "unjust." Shin Bet officers kidnapped Barghouthi at Nabi Saleh checkpoint northwest of Ramallah on April 24. He was kidnapped before on December 6, 2014 at al-Karama border crossing as he was trying to cross to Jordan and travel from there to the United Arab Emirates to attend a scientific conference. Barghouthi, 53, is a professor of theoretical space plasma physics at al-Quds University and has worked for some time at NASA in the United States. His scientific work is widely published internationally in academic journals. The Israeli occupation police on Monday evening arrested a young man in east Jerusalem and detained another during a raid on a mourning house in Bab Hitta neighborhood near the Aqsa Mosque. Local sources said that Israeli police forces raided a place used to receive mourners in the neighborhood and detained Ahmed Shawish for a while. The sources added that the policemen let the young man go after interrogating him. The police also arrested 30-year-old Mohamed Awaida, from Jerusalem, on allegations of his involvement in transporting the Palestinian who had carried out an attack last March in Jaffa. 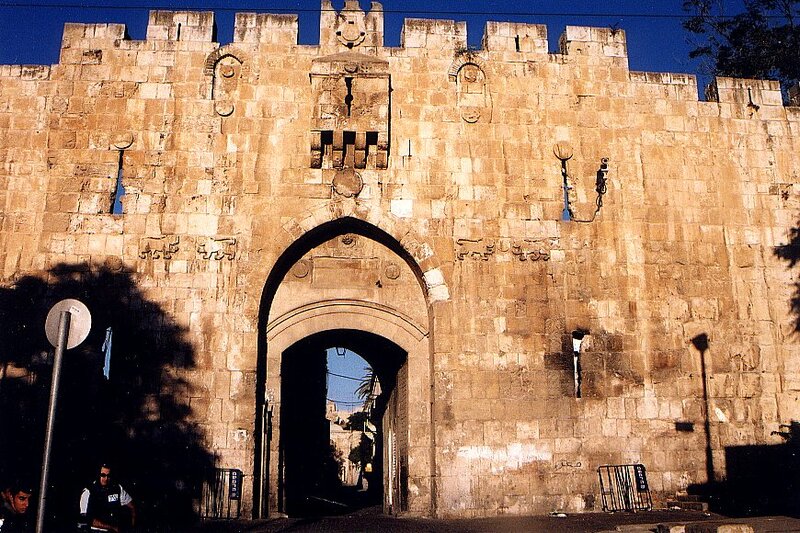 Israeli authorities say that they used a city-wide system of surveillance cameras to track down and arrest an 18-year old suspect for allegedly stabbing an Israeli man near Lion’s Gate in Jerusalem’s Old City. Neither the alleged perpetrator or victim were identified by the Israeli police at the time of this report. The alleged victim said that he was stabbed by a Palestinian in the chest, after which he called the police. Police say they then activated the Mabat 2000 surveillance camera network, which feeds live video into a central station. Police say they tracked the young man using the surveillance network, and captured him near the Western Wall. The alleged knife attack follows days of attacks by Israeli troops and police against worshipers at the Al-Aqsa Mosque in Jerusalem, the third holiest site in Islam. The attacks included violent arrests of a number of elders who serve as keepers of the Mosque.